Good. Baby likes it. No gas. Using formula to supplement breastfeeding. Baby likes it. Doesn't cause stomach issues at all. I usually have to stop feeding halfway thru to shake the bottle again, otherwise there's clumps left. Since my son was a month old I have been using Enfamil Infant and yet to encounter any issues. The powder works best for me but have also tried the concentrated liquid which is ready to feed. If you have a baby I highly recommend Enfamil. Great formula to transition from breastfeeding. No formula can beat breastfeeding, but this one isn't bad. 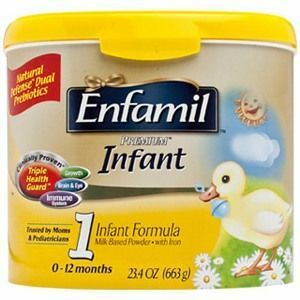 I didn't know where to start when looking at formulas for my 6-month-old; Enfamil Premium was recommended to me by my pediatrician. My son never rejected it, and segued into it without a problem. It offers all of the key nutrients that a baby needs, while trying to mimic breast milk. It dissolves quickly and thoroughly in water, making it fairly easy to prepare. I frequently receive coupons/checks and samples from Enfamil, so I feel that they're really looking out for my baby and me. While I purchase the basic, Premium variety, Enfamil offers many other varieties for babies' different digestive systems. About the pricing: formula gets pricy in a hurry. Some of the local grocery stores in my area offer sales on purchases of two or more. 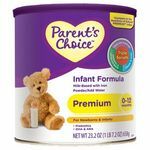 The best consistent deal that I've found so far is the 2-pack canisters from diapers.com (each canister is 27 ounces). My best advice is to keep your eyes peeled! The sales are out there! Not a fan of this formula. I'm not sure what it is about Enfamil Premium Infant Formula, but it did not agree with my newborn. I had been told that it would be one of the best ones to feed my newborn since I was unable to breastfeed, so I bought some of it and tried it out. The outcome was not so great. My little one didn't even make it ten minutes after feeding before they were spitting all of it back up. The first time it happened I thought maybe she had just eaten too fast, she has a tendency to do that. The next time I fed her with it, I burped her more frequently during the feeding, and made sure she took breaks while taking her bottle. The same thing happened for the next bottle. So we had to switch. The smell of this formula is also kinda gnarly. I have experience with just about every kind and variation of baby formula, but this one takes the cake in gnarly smells. It didn't mix very well. It came out clumpy, and I shook it pretty darn good too. The price was pretty steep for a product that I didn't have a good outcome with. I am sad to say, I would not recommend this. This formula was easy to mix and easily digested by my baby. I called the company several times and received great customer service. I enrolled in their loyalty program and was allowed to call the company once a month to get a coupon. Combining store sales and the company's coupon, this product ended up being about the same price as generics. I also called about a couple questions regarding the next stage formula and was given lots of helpful information in a friendly matter. Easily Digested My baby seemed to digest this easily, with only minimal gas. Ease of Preparation The only complaint I have is with the refills that come in foil packages that you are supposed to empty into the plastic container. I did this several times in hopes of saving money but I found that a lot of powder ended up stuck in the folds of the foil package. Otherwise, the powder seemed easier to mix than other brands and didn't require too much shaking. I never used any other formula but this Enfamil premium infant formula. My son wasn't latching to my breast so I had no choice but to use formula. I remember in the hospital they gave me these and ever since then I always used them. This formula was easy to use, I just added water and added the scoops and I shook and he was ready to eat. I remember always waking up in the middle of night I had the water ready in his bottle and all I had to do was add the formula and shake and he ate. It was really easy for me to make and it was great for my little one. They always got him full and they never made him gassy. My son was never a fussy baby and he digested these well. His stool was normal I never had a problem with this formula. It has a lot of vitamins and iron in it to help keep my son healthy. Every doctor visit he had they always told me he was a very healthy baby who is doing really good. I would definitely use this formula on my next child and I recommend it to any mother out there. 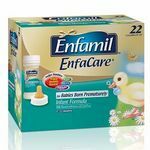 Enfamil Infant Formula really upsets my baby's stomache. I was feeding my baby girl this formula for awhile and I noticed she spit up a lot. She is my first baby so I thought it was normal for babies to always spit up. She would go number 2 like 8 times a day and continue to spit up and then would projectile vomit more often. I was beginning to get concerned and I felt bad for her because she would cry as if her stomach hurt her. 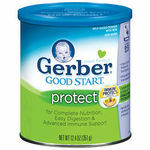 So my mother-in-law suggested Gerber Goodstart gentle formula. I tried it out and after I switched my daughter to that formula, she stopped spitting up so much, went number 2 less, and started gaining weight since her body was actually keeping the formula in. Easily Digested It always gave my baby an upset stomach and made her vomit so she wasn't gaining weight because of the fact that her formula was always coming back up. Ease of Preparation This the only good thing about it. Preparing a bottle is simple anyway no matter what brand of formula you are using for your child. 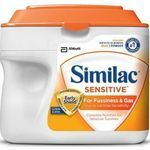 I was unable to breast feed with my son after having problems with my emergency c-section, so I used Enfamil premium infant formula from the time my son was a newborn until he was a year old. 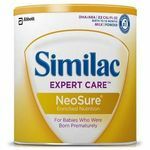 Although this is one of the more expensive infant formulas, I feel like it offers the best nutrition that most closely matches the nutrition found in breast milk. The hospital where I had my son started him out on Enfamil premium in the yellow containers and he thrived on it so we stuck with this formula and he continued to grow and develop really well and I always felt confident that he was getting enough nutrition with Enfamil premium formula! It is very easy to use. Just put the correct number of scoops into the correct number of ounces of water and shake the bottle til it's well mixed! It didn't leave a huge sticky mess or anything like that. Would definitely recommend Enfamil premium formula for bottle fed infants! When I had my son, I breast-fed for a while then switched to formula (it's tiring!). The hospital had given us those little bottles that are pre-mixed so I had those on hand and used them. If my memory serves me, we started out with a different kind at first and switched to this kind on a doctor's referral. (Well, he actually had samples.). Meanwhile, and we all know how this goes, we ran out and had some mailed samples of a different brand and used them for the evening, which turned out to be not a good idea. Even though it was mixed, trying to "ween" him, I reccollect spending most of that night with the baby being super sick, and of course, me having a lot of guilt. Needless to say, we kept him on this particular Enfamil and he did great! No issues at all. Easily Digested My son never had any issues at all. Ease of Preparation Obviously getting up in the middle of the night and mixing up formula powder is not as easy as those nice pre-mixed bottles, but it does save a lot of money!